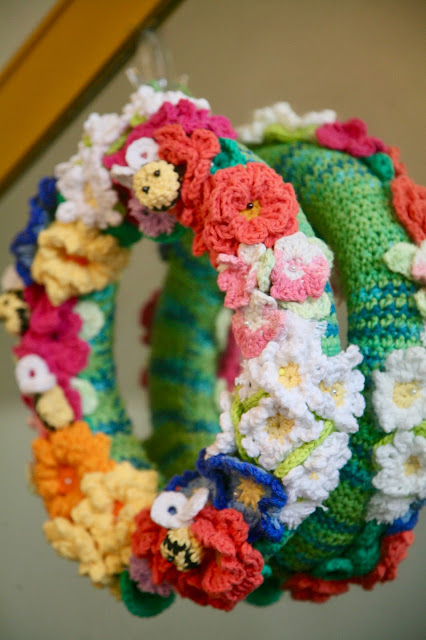 Inder Loves Folk Art: Crocheted Spring Wreath. 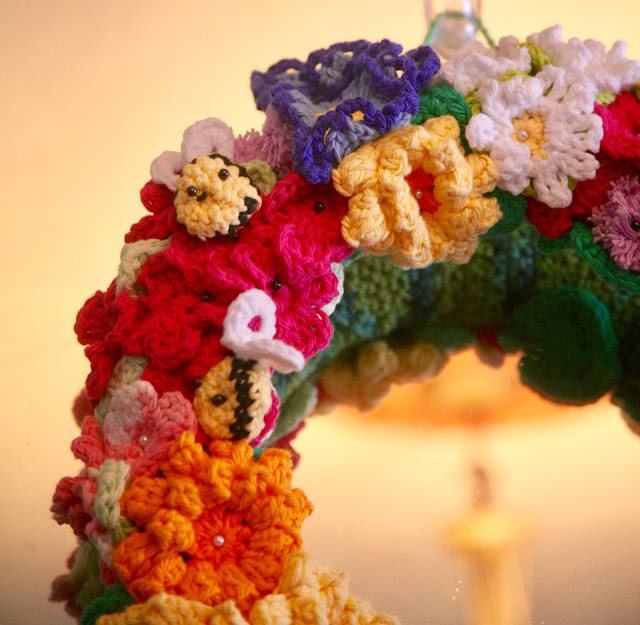 Sometimes you just have to drop everything and crochet a big pile of flowers, ya know? I have a subscription to Mollie Makes magazine, and follow their blog and Instagram feed. It's a British crafty magazine with a fun, retro-inspired, colorful aesthetic, which I discovered through their excellent books (crochet, patchwork, embroidery). Each magazine comes with a little kit that you can make, and there are often softies and other kid-oriented projects. Maggie enjoys looking through each new issue as much as I do! It was because of Mollie Makes that I discovered and started following Crochet by Red Agape's blog and instafeed as well. 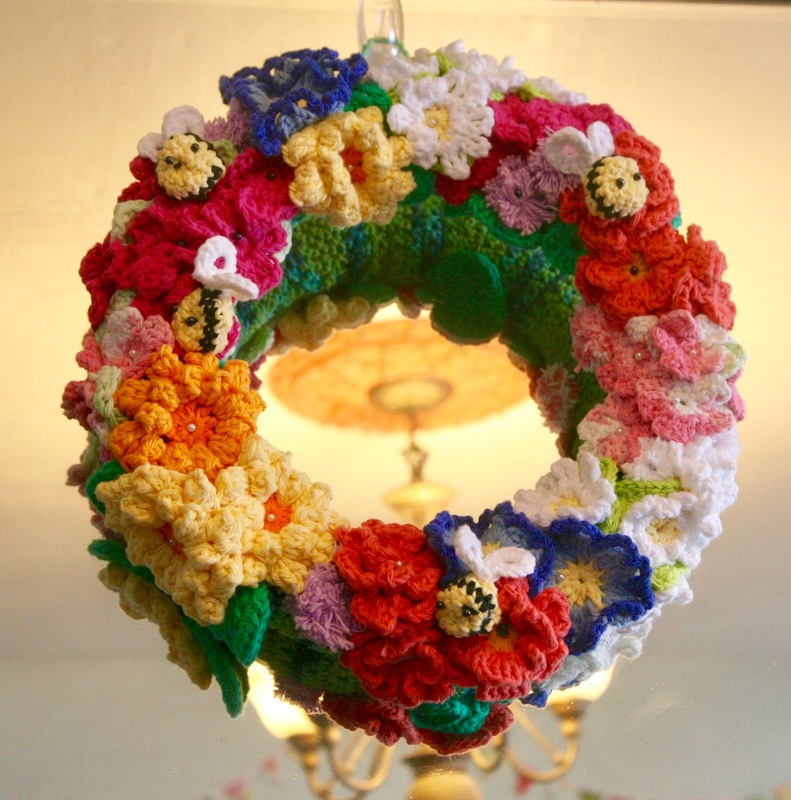 In late March, Mollie Makes and Crochet by Red Agape released, day by day, free patterns for the flowers to make this crocheted spring wreath. Each pattern was only available for download for 24 hours. After six days, if you kept up, you would have everything you needed to make the whole wreath. This came at the perfect time for me. Work was seriously stressful there for a couple months. I do realize that being a lawyer is an intrinsically high-conflict job, but that's why I became a transactional lawyer, right? I am a peacemaker and compromise-broker at heart, and when the conflict and negativity gets really intense (as does happen sometimes in local government! ), it gets me down! I needed a fun distraction. After making mini-wardrobes for the kids, I was feeling a bit burned out on garment sewing. Crocheting keeps my hands occupied while watching television and relaxing, and these flowers are very portable and quick to finish. The wreath is one of those lovely, campy, fun things that serves absolutely no practical purpose and is therefore the perfect antidote to a stressful month! Each day of the series, I looked forward to reading the next blog installment and downloading my pattern. I went to Michael's and stocked up on cheap Lily Sugar & Cream yarn. This is a chunkier yarn than what is recommended for this pattern, and gave my flowers an especially chunky, homely look, but it worked. I had to vary the colors a little but that was actually fun. It does tend to snag and split a lot while you're working with, though. Since then, I purchased some of the DMC Paintbox Yarn that is recommended, and I must say it's a lot nicer and easier to work with! But alas, it's not available at Michael's! Naturally, it took me a lot more than six days to make this wreath! It actually took me almost a month of crocheting in free moments to finish it! With a big push, I finished it just in time for Easter. The pattern is no longer available for free, but you can purchase it here, on Ravelry. 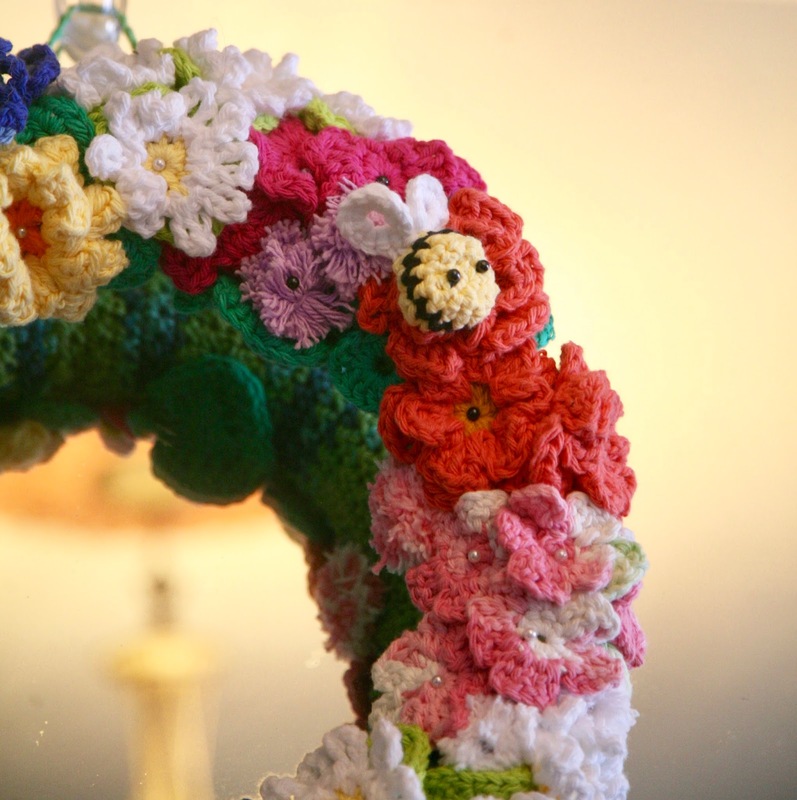 The flowers are affixed to a foam wreath that is covered in single crochet. 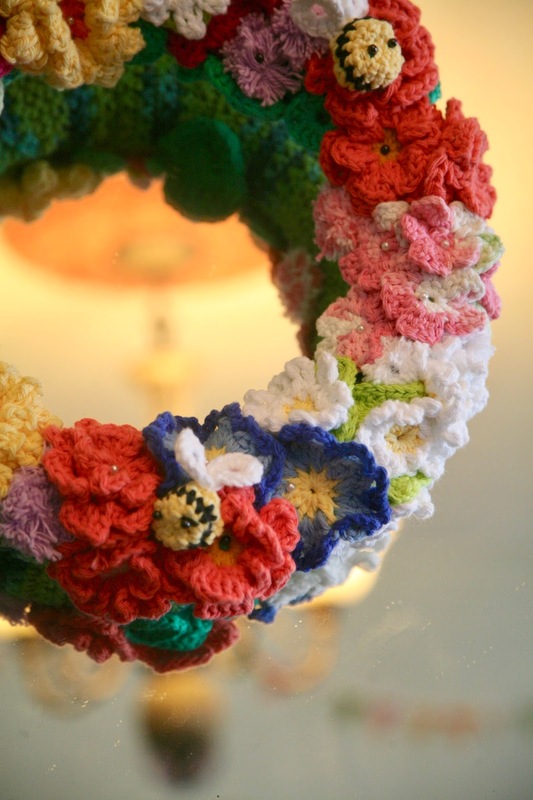 You basically crochet a scarf-like object and then sew it onto the wreath. The first wreath I bought was immediately snapped in two by my kids, who I think were pretending it was an inner tube? After that I guarded the second one much more closely! As you can imagine, with this many small pieces and different colors, weaving in all the ends took almost as long as the crocheting! Maggie loved working on this project with me, and (in addition to assisting in the destruction of a foam wreath) periodically helped me to categorize and count leaves and flowers. She made several of the pom-poms (with my help) and she helped me arrange the flowers on the wreath when everything was ready to go. I think I've shared that Maggie spends most of her time at our play-based preschool in the art room, making things? That one takes after her mother! I am happy for her - a passion for creating is a wonderful blessing in life! But both kids were completely taken by the little bees, which were my first foray into the world of arumigumi-style crochet. I have promised to make them a couple of bees just to play with! I think the bees are what first drew me to this fantastic pattern, and they are indeed adorable! I ended up affixing the flowers and bees to the wreath with florist's pins (you could also sew or glue the flowers in place), and the black pearl pins were perfect for bee eyes! In addition to being fun and relaxing, this is a great learning project for a beginning crocheter. I learned a lot of new stitches and techniques and improved my basic understanding of how crochet works, in really easy and manageable chunks. 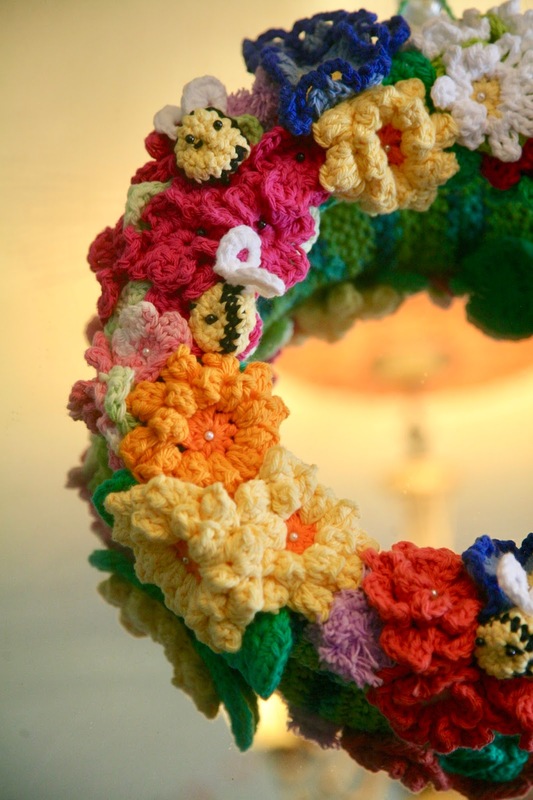 If you can make a granny square and read a basic crochet pattern (warning: the pattern is in UK terminology, so I had to adjust to that and look up terms as appropriate), you can make this wreath. I promise! This was a really FUN project, and I was super delighted with the final product, homely and camp though it may be! I'm not going to try to pretend that this is tasteful or low-key or minimalist: it is none of those things, but what it is is exuberantly happy! This was such a joy to work on and put together, and provided a soothing and joyful distraction during a pretty heavy-duty month for me! Lately, with renewed interest in "mindfulness," I'm seeing lots of craft books with titles like "Crochet Therapy," and "Crafting for Mindfulness," or whatever. It's like people are just now discovering that crafting is a soothing, sanity-saving activity and that it promotes good mental health! I'd like to think I was hip to that trend before it was even a trend, right? Ha! So, I'm happy to say that work has calmed down a bit since March (knock on wood), but if you ever feel really stressed out, may I suggest making something lovely, fun, and completely useless? It really is the best form of stress relief. It is just delightful, so happy and pretty. Very pretty, Inser. Those bees are adorable; I can see why the kids love them! It is so true! We had a terrible month in April, too. I was so sick and then Dan was hospitalized 3 times in one month for a total of 9 days. Long story but one of the reasons was an antibiotic-resistant staph infection. Sooooo.. that was rough (so rough!) but sewing brought me so much joy. Sewing and photography. It is totally therapy. Love to read that Maggie spends her time in the art room - the sweetest! And those bees are truly adorable. Indigo really likes knitting and crocheting and I'm wondering if she might be ready for a Granny square blanket? Do you think that's a doable beginner project? Lovely! The craft of crocheting only requires less expensive supplies and materials, which are commonly threads and yarns that they can purchase in nearby markets.